With an increasing percentage of the consumer demographics opting to shop online, internet advertising is now a multi-billion dollar industry. This paradigm shift, however, is a result of a colorful past. Today, through this article, we are going to take a glance back at the beginnings of this industry. We are going to revisit the journey of how it has grown and flourished and held its place in a world where once print, television and radio were the only source for advertising. The first ever Spam email to annoy email owners was sent on May 3, 1978. The recipient list was 400 users long and was taken from the ARPAnet directory. ARPAnet, for the geeks in all of us, stands for Advanced Research Projects Agency Network. It is considered to be the precursor to what we now know as Internet. Widely known as the “first internet”, it was used as a highly secure medium for information flow between universities and research centers across the globe. The first four nodes that were connected to this network was located at UCLA, UC Santa Barbara, University of Utah and Stanford Research Institute. Swerving back to the topic, the creator of the first spam email advertisement ever to hit the inbox was Gary Thuerk, also known as the father of spam, not a very inspiring title. He was a marketing manager at the Digital Equipment Corporation. Although DEC had a strong presence in the East Coast, considering the fact that it was an East Coast based corporation, the email was an attempt to reach the West Coast technological enthusiasts. 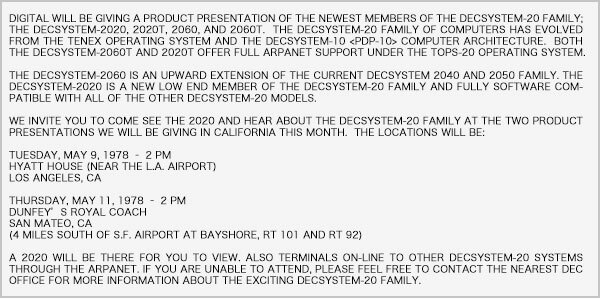 Specifically, the email was an invitation to West Coast users to a product demonstration of the then new Decsystem-20 by Digital. The length of the recipient list was so huge that many email id’s flowed down into the body of the message. Although some were happy about the notification, the majority were angry at Thuerk for crashing their computers and for the unsolicited contact. The outrage by the Defense Communication Agency (DCA) against that email was strong enough to keep any spam away from hitting another inbox for almost a decade. In the year 1980 when Usenet, which was an online discussion forum where people could post messages on newgroups, was created, it used to get flooded with new posts, but after the introduction of spam and mass messaging, people where sending out huge number of emails. Global Network Navigator, in 1993, was the first commercial website to sell a clickable ad (later they were termed as “banner ads”). It was sold to the law firm Heller Ehrman White & McAuliffe. GNN was basically an online information portal that consisted of a news center and it also acted as a product catalog. By April 1995, advertisers like Mastercard and Zima were paying GNN $110 to $11,000 per week for ad spots. In June 1995, GNN was acquired by AOL for an estimated $11 million. It was closed in 1996, and all the subscribers were moved to AOL’s dial up service. However, it was in October 1994, when the team at Hotwired – the first commercial web magazine – deliberated on ways to pay their writers and the idea came in the form of selling ad spaces in large quantities and the term “banner advertising” was coined. The plan was to create special sections on the website for the banners to be displayed on. The idea was not entirely new though. AT&T was one of the first companies to buy ads on Hotwired. You see, internet is now one of those things that is taken for granted. It’s hard to imagine a life without it. But before the internet, when people wanted to get connected online they had to opt for different measures. You could use a Bulletin Board System to stay connected locally unless the system operator was connected to a network like Wildcat, or to stay connected on a nationwide level, you had to use a paid service, like Prodigy. People were fascinated and excited with Prodigy’s ease of use and the fact that they could access news, sports, email, bulletin boards, and weather info along with one un-clickable ad at the bottom of every page, all in one place. This premium service costed $12.95 a month. All in all, people loved it. Prodigy’s failure seemed unfathomable at that time. But it happened. Prodigy never thought how much time users would spend on its portal (if you can call it that), so it was not designed for high user activity. However, the Prodigy users instead of reading news, sports reports went straight to using interactive elements like bulletin board and email. In 1990, 3.5 million email’s were sent by just 5% of the members, which proved very expensive to Prodigy. Although, big advertisers like IBM and Sears helped soothe the problems, the nightmare had just begun. In 1991 Prodigy decided to censor their emails and bulletin boards. It was to reduce the traffic and outgoing emails it was receiving. They banned negative comments about advertisers, profanity against anyone especially others users. In fact, not long after, Prodigy ended up banning all posting that mentioned others user’s name, to curb ban on online flaming. They even put limits on the number of emails users could send. All these rules and actions along with the rumors that Prodigy was reading everyone’s email and in fact infecting computers with spyware created an uproar among its users. In 1994, however, Prodigy made a huge mistake by offering unlimited chat rooms with no extra fee. This meant very high traffic from users spending 8-10 hours in these rooms. Prodigy could not handle the expenses so it shut the chat service down. Users showed their outrage with bumper stickers and t-shirts with anti-Prodigy messages. Hateful postings started appearing on other Bulletin Board Systems. To cover the skyrocketing costs, Prodigy increased their premium prices and introduced per minute fee on some of their services. 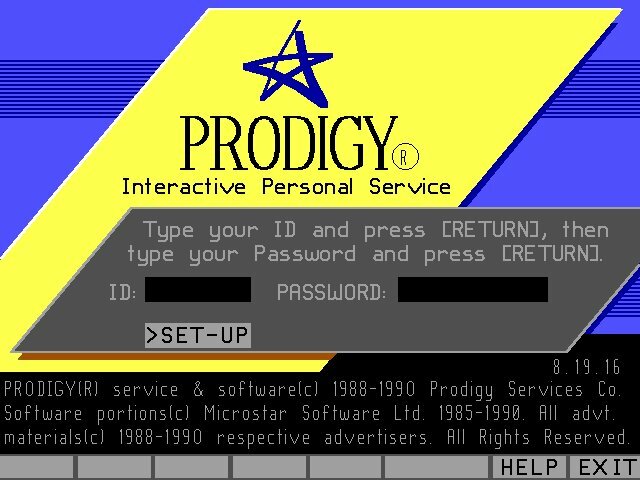 In 1997, Prodigy transformed into an ISP but they couldn’t survive the 1999 Y2K problems and finally closed down. But in a nutshell, long before Hotwired, existed Prodigy which was the first online web service that offered a plethora of resources like news, weather, email communication services and option to buy merchandises and groceries all under one roof. It also had on the bottom of its each page, an ad. Before introducing the monthly subscription model, Advertising and e-shopping were the only way for Prodigy to generate revenue for the company. The problem though was that it interfered with the user experience, who were more interested in communicating with other members through their email service. This resulted in the invention of first ever ad blocker which basically came in the form of little piece of plastic placed on the bottom of the screen, to block out the ads. Coming back to Hotwired and the year 1994, The first banner ad to grace its site was by AT&T, who wanted to use it as a means to promote their new campaign “You will”. The ad was designed by the creative director Joe McCambley who worked for Modem Media, a digital agency. When the users clicked on the ad they were taken on a virtual tour of seven of the world’s greatest museums. The thought behind this concept was to impress upon the users how AT&T could help them travel across time and space through Internet. The ad space was bought for three months at the price of $30,000. It produced a click through rate of whopping 44%. 1994 was also the year when CompuServe and America Online introduced their web portal. Marc Andreessen and Jim Clark start NetScape. CMP’s Tech web – a site that provided information of computer and technology related products – was launched with banner ads from AT&T, Tandem Computers Incorporation and MCI. Vibe- Time Inc.’s culture magazine – received $20,000 from MCI communication for an ad on its homepage. Other sponsors of Vibe included Air Walk Footwear, Timex Corp, General Motors, Saturn and Jim Beam Brands Co for $20,000 a piece. 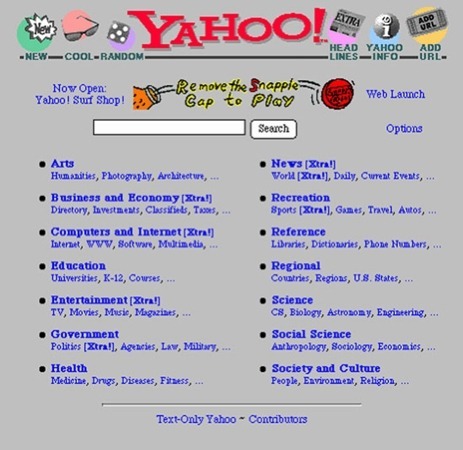 In 1995, Yahoo transformed itself from just being a web directory to a commercial business, the same year in which they did the first keyword based advertisement. Around the same time, AT&T and Saturn purchased banner ads on Pathfinder for $30,000 and a report from Forrester Research pegged the online ad spend at $37 million. CBS launches its Web site. Same year, an important change happened, Netscape and Infoseek changed their advertisement pricing model to CPM (Cost per Thousand Impressions) based. August 1995: MSN online is launched by Microsoft. The Internet Advertising Council is assembled. WebConnect, an advertising agency that helped with ad placement on internet, placed banner ads for the well known Encyclopaedia – Britannica. Their ICS tracking system helped track impressions along with click through rates. They did this by providing each of their clients with a password protected URL through which they could access their campaign details anytime. Along with that, unlike other agencies during that time which only placed ads on their network of websites, WebConnect was an open network, which means, depending on the nature of the advertisers’ website, they could place an ad on any site that best matched their user demographics. Their Site Price Index (SPI) tool showed the advertisers the cost of placing an ad on up to 140 sites. BrandROI tool helped capture the number of sales and inquiries from each ad. Their Web Index Site Evaluator (WISE) helped website owners, who accepted advertising, present sponsors with information about their site. The CustomView tool helped place frequency cap on the number of times an ad becomes visible to a user. This was created based on some studies which showed that after presenting a visitor the same ad 3 to 4 times, the chances of them clicking on it decreases significantly. This tool prevented “banner fatigue”. In same year-1995, ESPNET found 8 advertising sponsors bringing in contracts worth more than $1 million. By the end of the year, more than 24 million adults in North America are online. 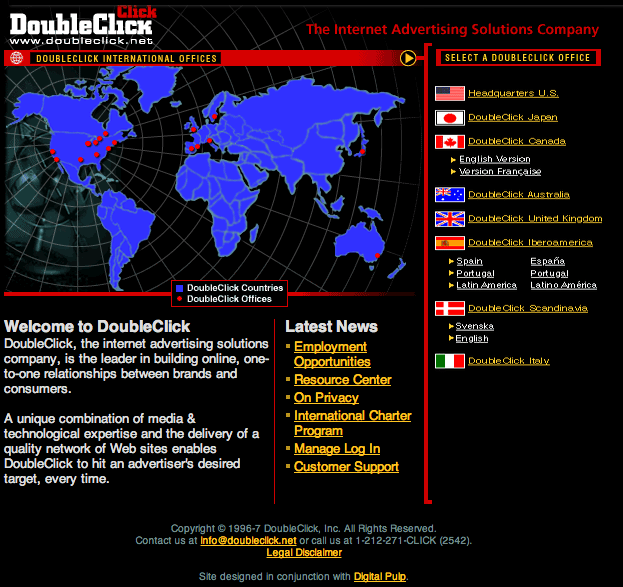 Next major milestone in the banner ad industry was the launch of DoubleClick – an online ad-related-services providing agency- in 1996. This platform gave online advertising an entirely new perspective. Before Doubleclick, the ads were not organized or coordinated. Not only that, before its creation it was hard for websites to find parties interested in buying ad spaces. Doubleclick not only created a way to track banner ads and consumer behaviour but it also helped track the ROI. The banner was a great way to produce revenue for the websites and Doubleclick themselves. It was around this time that the surge in the number of content websites, whose revenue was based on selling ad spaces, happened. Before the end of the year 1996, Doubleclick developed a technology called DART (Dynamic Advertising Reporting and Targeting) which helped advertisers to track the clicks and optimize their ads before the campaign ends. Because of its huge network, Doubleclick allowed its advertisers to advertise in a plethora of websites, and unlike print and radio, Doubleclick provided the advertiser a chance to customize their ad campaigns depending on its performance. For example, if an ad was not doing good on one website, the advertiser had the option to take the ad down from that website and focus on another one that was producing results. DoubleClick made its revenue by brokering ads and by offering premium tracking & analytical services to their advertisers. The price for advertising on their network was based on Cost per thousand impressions (CPM) model. Doubleclick also generated CPM revenue from the email marketing services it provided. Doubleclick was seen as quite successful and raised multiple round of funding. In fact, it was one of the few companies which had a lot of money in the bank ($900 Million to be exact) and survived the Dot com bubble. This was also the time when the click through rates starting dropping. Before going to the offer page, the users, after clicking on an ad, were taken to a landing page. Considering the fact that a banner ad was converting at 0.1% and even less of those users where actually entering the offer section, the effectiveness of banner ads took a dip down south. 1996 was also the year when Microsoft paid $200,000 for the sponsorship of Superbowl Website. This year New York Times made its presence online with ads from Chemical Bank and Toyota Motor Corporate Services and Douglas. Shortly after, the wall street journal starts its website too. In Feb 1996, Focalink Communications launched its MarketWatch and SmartBanner Media Planning Service. FocaLink provided Web management and advertising products for other advertising agencies and web owners. Their MarketWatch, a web research and planning tool, and SmartBanner, an ad placement and reporting tool, garnered widespread popularity for them. With thousands of businesses flocking to create e -stores, and websites, the amount of banner ads also increased. With it came the standard ad sizes. 468X60 was the first and basic standard size. Other sizes that became popular among advertisers were 125×125 cubes, 120×600 skyscrapers and 728×90 leaderboards. 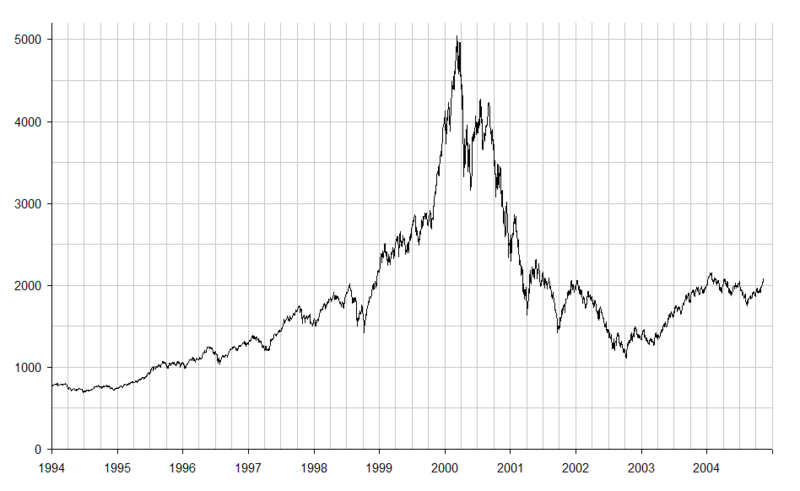 Mid 90’s to 2000 was known as the dot com bubble and it finally busted in the year 2000. The most highly affected area was the Silicon Valley. Dot com bubble was fueled by the opening of thousands of new websites, and tech start ups. But most of these companies saw a huge loss of money, depleted their raised capital and could not raise more, which gave rise to a small recession on the beginning of 2001. Banner ads were resulting in lower click through rates. But companies were still spending millions buying a spot. The ROI was not anywhere near impressive. Most of these new businesses focused on expanding their consumer reach instead of focusing on profit growth. They assumed that reaching a huge customer base would also increase their profits. To reach this goal they spent a huge amount on advertising, which didn’t pay off. Investors were blindly investing in start ups with big ideas rather than strong business models. Unfortunately, many of these companies closed within the first few months of starting. During this time, technological stocks lost almost 60% of their value; in fact, NASDAQ composite went down from 5046.86 to 1114.11, which was a decrease of 78%. By mid year 2000, the internet advertising revenue dropped by 32%. After the dot com bust, website owners could not rely on banner advertising alone as a source of generating revenue. The prices of banner ads decreased and so did the click through rates. The search of finding another effective alternative ended with pop up and pop under ads. Although the use of popup ads can be tracked back to Late 90s, they became really prevalent during this period since they were said to be more effective and harder to ignore than static ads. Pop up ads work by opening a new window that appears when a user tries to access a website. The pop up might be an advertisement to a different product or it can be a means to capture information such as your email. When pop up windows started to annoy the users, its sister variation- pop under was born. ExitExchange is the company which claims to have invented pop-under ads. The founder and CEO of Exit Exchange, Andrew Vilcauskas, said the pop under advertising was a more “polite form” of showcasing ad. The idea came when he started noticing several ISP customers complaining about pop up windows. Although, many users find these ads aggravating and intrusive, the idea was to capture the attention of the visitors, something the static banner ads were failing to do. The result- it worked, at least when compared with traditional ads. However, very soon a lot of popup blockers appeared, its effectiveness declined and they were no longer considered as an online display marketing medium. By 1999, the online advertising industry had already reached $1 billion. With the number of web sites increasing in the late 90’s , the need for search engines became more predominant. It was during this time that Search engines like AltaVista, Lycos, and Infoseek expanded their services. Yahoo also diversified its services from just being a directory of websites to a search engine and then a web portal. Pay per click came into being as a means to help search engines generate revenue. It was in 1998, same year as Stanford graduate students Larry Page and Sergey Brin founded Google, that Goto.com’s Bill Gross invented a similar model to PPC called the paid placement model (PPM). 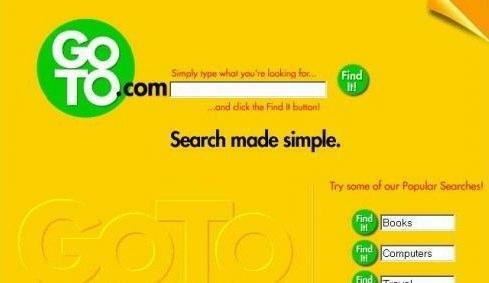 Goto.com, later became Overture, and was then acquired by Yahoo for $1.63 billion. Credit for PPC model is generally given to Bill Gross. Google was looking for a way to monetize its search engine, and because the brand was known for providing the best quality search experience for its users, monetizing with textually relevant ads instead of banner ads seemed like a good option. Google launched its search engine service in 1999 and it was in 2000 that the Adwords was introduced. The PPC model however, was included only in 2002, before that it was all CPM. Yahoo, on the other hand, offered its ad based on the PPC model right from the beginning in 1998. As mentioned above, Goto.com already offered a pay-for-placement model. 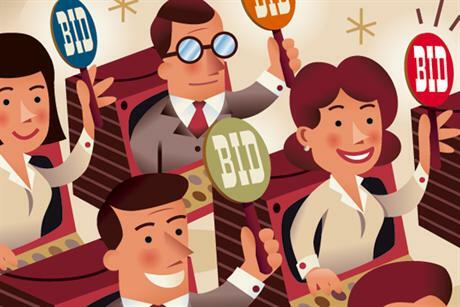 In 1998, however, it introduced the ability of automated auction/bidding, whereby the ad would be ranked for a key term, based on how much the advertiser was willing to pay. The advertiser would then pay Goto.com every time a user clicked on the ad. By mid 1998, people were paying as much as $1/click. The reasoning behind PPM was that the people who were willing to pay for top spots in general searches were more relevant and better websites. In 2001, GoTo.com renamed itself Overture. It allowed web portals like MSN and Yahoo to monetize their traffic. This proved to be highly profitable for both Overture and its partners. In fact, it even brought portals like AltaVista and AlltheWeb. In 2003, Overture was brought by Yahoo. In 2001, where Google made $85 million from its CPM based ad revenue, Overture earned $288 million selling ads on a PPM (Paid Placement Model – Overture’s version of PPC) basis. In 2002, Google revamped its Adwords program. It reintroduced Adwords which now included the option of PPC advertising. Google’s version of PPC was different from Overture’s PPM. Where Overture allowed its users to buy their way to the top, as in – the higher your bid, the higher your listing; Google understood the importance of relevance and better user experience. You see, any big company could buy their way to the top, but if the ad was not relevant then it would generate less clicks, the users who end up clicking will not get anything relevant to what they searched for and the company would make no profit either. For a more robust ranking mechanism, Google, as a means to measure an ad’s relevancy, introduced the “Click through rate” feature. This meant that if an ad with a lower bid got more clicks than the others above it, it would climb up the ranking ladder. A more sophisticated version is called the Quality Score today. Google did not invent the Pay per click model, but it simply adapted and perfected it. Today, almost 96% of Google’s revenue comes from advertising. Social media has revolutionized the online advertising industry. It’s interesting to note its development. It won’t be wrong to say that, online advertising has gotten powerful in a very short period of time thanks to social media. Let’s first look at Facebook. Although primarily formed for people to stay socially connected, the fact that more than 7.3% of the world’s population use Facebook has made this platform perfect to be used as a marketing tool. Reports show that advertisers have spent more than $4 billion on Facebook advertising. Facebook didn’t really concentrate on advertising until 2 years after being created. In 2006, Facebook announced a one year marketing agreement with J.P. Morgan Chase to promote its credit card. Facebook members at that time where able to see ads inviting them to join an exclusive Chase network that would earn them reward points. That same year, Facebook and Microsoft teamed up for advertising syndication. It was a strategy to bring relevant ads to the 9 million Facebook users. Microsoft was the sole provider of banner ads and sponsored links on the Facebook platform. In the year 2007, due to the negative response of Vodafone and other Britain based companies ads appearing next to a far-right British Political party, Facebook introduced the opt out feature giving ad owners the ability to prevent their ad from appearing. In 2008, Facebook launched “Facebook ads for businesses and it also established the ad platform, “Beacon” that was more geared towards viral brand messaging. In 2008, it also introduced engagement ads which were used to captures users attention with its viral and powerful messages. In 2009, Facebook added features with which advertisers could now target demographics based on language and radius. It also launched Self Service advertisement through which anyone could purchase an ad with a credit card. In 2010, Facebook shut down Beacon. It then introduces social context metrics to its analytics. In 2011, Facebook launches Sponsored stories. Since 2011, they have introduced Ads API and are constantly updating their advertising analytics so that advertisers are able to advertise to their targeted niche. In March 2013, Facebook acquired Microsoft’s advertising platform – Atlas. The deal was valued at less than $100 million while the technology behind Atlas (aQuantive) was purchased in 2007 by Microsoft for $6.2 billion. They are now focusing on optimizing their ad platform for mobile users as they account for majority of their traffic. At $5 billion, Facebook advertising makes up for majority of their revenue. Twitter is another platform that was created not with advertising in mind, but to connect with others in 140 characters text sized messages. With its steady growth and its sponsored tweets plus trends, it is reaching the status of an advertising powerhouse. In 2009, 4 years after its launch, Kim Kardashian was said to be paid $10,000 per tweet through the advertising company Ad.ly to advertise to her followers. In 2010, Twitter introduced Promoted trends and Promoted Tweets. The first promoted trend was Disney’s Toy Story 3. Some of the twitters’ early advertisers included Virgin America, Starbucks and Bravo. In 2010, Twitter also launched its promoted account feature which allowed businesses and brands to be included in the “suggested for you” category in the sidebar. In 2011, with Charlie Sheen joining twitter, he becomes the first person to reach a million followers within 25 hours. Just a few days after joining he engages in promoted tweets for interships.com through Ad.ly. As of 2012, Twitter’s mobile advertising revenue has exceeded Facebook’s mobile ad revenue, with $129.7 million to $72.7 million. Twitter’s revenue is expected to double in the year 2013. Another powerful force in the social media advertising realm is, off course, YouTube. It was founded in 2005 and by the end of that year there were 8 million videos being viewed per day. This amount increased to 100 million views per day in the year of 2006. In 2006, YouTube launched its participatory video ads and brand channels. The participatory video ad is a user initiated video content with features like rate, share, favorite, comment and embed options enabled. With brand channels, YouTube gave marketers an opportunity to put out video content consistent with their brand. The first brand channel was Warner Bros. Records. In October of 2006, YouTube was acquired by Google for $1.65 Billion. In 2007, YouTube was launched in 9 countries. Its mobile version was also introduced. Along with that, this was the year of In-video ad and YouTube partnership program. In the year 2008, YouTube launched promoted videos and pre-roll ads. In 2009 and 2010 YouTube partnered with Production houses to introduce full length TV shows and movies on Youtube. In the first quarter of 2013 alone, Martin Pyykkonen, Wedge Partners Corporation Analyst, predicts Youtube generated $350 million in mobile ad revenue. Banner advertising – Although the effectiveness of banners is low now, according to MediaMind, banner ads account for a huge part of online ad impressions. They reached their sharpest decline in 2008 and since then, studies show that the average click through rate has been somewhat steady stable. The main reason for this, according to MediaMind, is banner blindness. People are constantly exposed to display ads, and even if they see them in their peripheral vision, most users have learned to ignore them. Their main competition, according to CEO of Direct Impact Group Andrew Gordon, is social media. Adobe’s Wadell says that despite its low effectiveness there will always be a place for banner ads. The reason being that the technology is becoming sophisticated day by day, and with that comes features which can help the advertisers narrow down their demographics more effectively. Retargeting – Retargeting is one of the technologies which really helped increase the relevance of banner ads and improved the ROI for advertisers significantly. It works in a simple way. A site will store a cookie in the browser of your visitors and using that cookie, your visitors can be targeted and shown customised banner ads. So, the ad is relevant for them, as they have already visited your website. As an example, you can think of a visitor who was interested in your product and opened the order page, however, he got busy or could not make the buying decision that point in time. Using retargeting, you can reach the user again, show him benefits and case studies about your product via banner ads and improve the chances of converting that visitor into a customer, who was otherwise a lost prospect. Since retargeting generated higher ROI for marketers, they are willing to spend more on such campaigns and the publisher benefit from it too. Although, early usage of retargeting can be seen from 2007, it started picking up traction in Late 2009. Remarketing lists for search ads (RLSA) – Recently launched by Google Adwords, RLSA allows advertisers to differentiate individuals based on the information if they have visited the advertisers’ site or not. In simple language, what this means is that when bidding on keywords using Adwords for Search marketing, you can customize the bid for users who have already visited your website before and have a higher chance of conversion. Pay Per Click Advertising – CPC has been the major attraction of huge ad services like Adwords. But to survive in the huge competition for literally every niche, advertisers will have to learn to master analytics. They will have to do thorough market research and know exactly what their target demographics are. Tracking + Analytics is and will be crucial- it is the only way to avoid wasted dollars. It is proving harder and costlier for small businesses to survive with CPC. Choosing the right and most relevant keywords will be the key to to a profitable campaign. Social Media Advertising– This industry in blooming, and if used right can prove to be extremely profitable, that is until people start becoming accustomed to them. Right now, a promoted tweet from a famous celebrity can garner a lot of sales. Product endorsements and sponsorships have not lost its charm yet. Also, in this era of viral marketing, quality content is the best form of advertising. Real Time Bidding: Created by Jason Knapp, Real Time Bidding has been slowly but surely revolutionizing the way online advertising works. While its complicated concept can intimidate the minds of many, being unaware of it can prove to be a costly mistake. Sales from RTB are increasing on a yearly basis. According to Business Insider, in 2010, it was merely 4%. In 2011 that increased to 10% and in 2012, RTB sales accounted for 16% of banner ad sales. If this growth trend continues, then by 2015, this number will reach up to 27%. Unlike traditional ads, what makes RTB unique is that advertisers only pay for the impressions that they want, and the publishers receives the best rate for that impression. Here is how it works. A user opens on a publisher’s website. Using the DSP (demand side platform) the publisher then sends a bid request with the visitors’ demographics (age, gender, location, online buying history etc) to all the relevant advertisers on the RTB Exchange. Within a few micro-seconds, advertisers submit their bids using automated software. The Exchange then analyzes the bid and winner’s ad is then shown. RTB is works great since it is fast and minimizes lost dollars for publishers. Right now, a lot of Ad Networks use a RTB Exchange to increase their fill rates. As far as numbers are concerned, in 2012, RTB grew exponentially in the mobile advertising industry. Nexage reported a 37% increase in revenue every month. Adfonic saw a increase of 22 billion ad requests. MoPub reported that in the third quarter RTB auctions skyrocketed by 162%. One of the biggest RTB Platform/Exchange is Rubicon project. In fact, in January 2013, it surpassed Google in U.S. Audience Reach (214.2 million monthly uniques or 96.7% of the U.S. Internet audience), ranking #1 on Comscore, for the Sixth Consecutive month. Ad Revenue Optimization: As we already read above, the power of Banner ads has declined primarily due to Ad Blindness. The fall from a CTR of 44% to an internet average of 0.1% is huge. 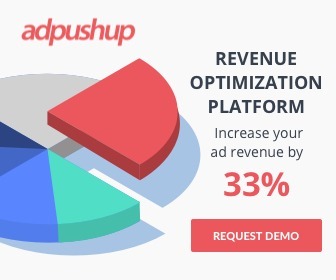 Ad Revenue Optimization is the solution here. Continuous Testing and optimization to improve the overall performance of an ad unit. In simple language, what this means is, creating different variations for your webpage with different size, location, type and design of ads and testing which variation performs better, but do not confuse this with simple A/B Testing. The testing here never stops. The reason is simple – you will clearly see a variation performing best in terms of CTR but with time, ad blindness starts to kick in, again. Hence with machine learning based optimization, the algorithm starts testing other variations as soon as the ad blindness starts to appear in the currently best performing variation. Ad Revenue optimization is a wide subject and overcoming ad blindness is only of the objectives. It can also help you compare multiple ad networks and give more weight-age to the network which performs better in terms of revenue generated. Similarly, it can do a host of other automated optimization on the basis of the collected data and user behaviour patterns, but the aim of ARO is simple, which is to produce the highest amount of revenue per visitor, for a website. Taking this one step further using Automated user segmentation, where you segment website visitors on the basis of multiple parameters such as traffic source, user behaviour, visit frequency, browser, screen size, etc and show them a customized or personalized version of your page which has proved to perform best (in terms of generating Ad Revenue/Clicks) for each segment. Advertising is fickle. It is constantly changing, because its targets- the people, and people are dynamic. As an publisher, the best thing you can do is adapt, test and not spread yourself too thin. Today, more than ever before, measuring and tracking is paramount. Many small and large businesses have gone bankrupt due to huge monetary resources being spent on ads- ads that yielded no result. For Advertisers, Before buying an ad- no matter which type- you have to realize that every small details matters- the ad copy, the creative, the targeting of the ad. Not just that, an ad that might bring in a positive ROI for a few weeks might start turning negative. Why? Because your customers’ behaviour changes constantly, which is why tracking will keep your campaign from turning into an expensive mistake. Feature Image Background by Ben Newman.